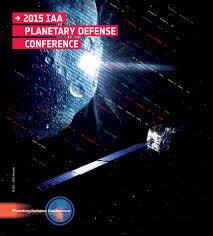 I spent the week of April 13-17 in Frascati, Italy, attending the 4th international Planetary Defense Conference (PDC) – a biennial gathering of experts concerned with protecting Earth from future asteroid impacts. Here I’ll offer some highlights of the week’s discussions. First, the good news: of the more than 12,000 known near-Earth objects (NEOs) – asteroids and comets predicted to come within 0.3 astronomical units (28 million miles/45 million kilometers) of Earth on a future orbit around the Sun – none pose a risk of impact with Earth (See the Jet Propulsion Laboratory’s NEO impact risk table). Of these 12,000 NEOs, 1,574 are currently deemed “potentially hazardous” – predicted to come within 0.05 AU (4.65 million mi./7.5 million km) of Earth on a future orbit. These numbers will change, of course as new NEOs are found and further observations of known objects improve the accuracy of predictions of future orbital movements. Space agency officials from around the world reported at the PDC on the status of their plans for planetary defense – ranging from work with emergency management agencies in case of an unavoidable asteroid impact with Earth to plans for launching multiple spacecraft to an asteroid on an impact course with Earth to deflect it off its orbital path toward us. Collaboration and coordination is improving among the various agencies, programs, and projects focused on finding, tracking, and characterizing NEOs and identifying those that are potentially hazardous to Earth, in part due to the formation of the International Asteroid Warning Network (IAWN). NASA’s NEO Observations Program, the European Space Agency’s Space Situational Awareness Programme-NEO Segment, and the NEO Dynamic Site (NEODyS), among others, are participating in IAWN. NASA’s NEO Observations Program* head Lindley Johnson said the NASA program’s updated program objective is to discover at least 90 percent of NEOs larger than 140 meters “as soon as possible.” Primary assets supported by NASA to find and track NEOS are the Pan-STARRS (Panoramic Survey Telescope & Rapid Response System) facility in Hawaii, the Catalina Sky Survey in Arizona, and NASA’s space-based NEOWISE infrared telescope. Primary assets supported by NASA to characterize NEOs are the Arecibo Observatory in Puerto Rico, the Goldstone station of NASA’s Deep Space Network, the Infrared Telescope Facility, and the Spitzer Space Telescope. The NASA program currently has an annual budget of $40 million. The President’s budget request for the program in fiscal year 2016 is $50 million. Gerhard Drolshagen, co-manager of the NEO segment of the European Space Agency’s Space Situational Awareness (SSA) Programme –NEO Segment , said SSA Programme funding for 2013-2016 is 50 million euro. (The SSA Programme is responsible for space weather and space debris as well as for NEO observations.) One of ESA’s new NEO projects is NEOSTel. The agency has funded detailed design work for this automated, ground-based “fly-eye” telescope system to survey the sky for NEOs. Completion of the project, which ultimately will include four telescopes, will cost about 10 million euro, Drolshagen said. Boris Shustov of the Institute of Astronomy at the Russian Academy of Sciences reported on Russian assets involved in NEO observations. Telescopes in the International Scientific Optical Network (managed by the Keldysh Institute of Applied Mathematics at the Russian Academy of Sciences) devote some time to NEO observations. Next year, a new wide-angle 1.6 meter telescope, AZT-33VM, located at the boundary of Mongolia, will see first light. This telescope will be suited to detecting large (greater than 50 meters) distant asteroids. Alan Harris, European Union coordinator for the EU’s NEOshield Project, reported on the start-up of NEOshield-2. NEOShield was set up to carry out a detailed analysis of open questions relating to realistic options for preventing NEO impacts with Earth. This March, work began on NEOshield-2. The EU granted $4 million to NEOshield. It has granted $6 million to NEOshield-2, for work to September 2017. Makoto Yoshikawa of the Japan Aerospace Exploration Agency (JAXA) reported on the creation of the Asia-Pacific Asteroid Observation Network. Current members include Japan, South Korea, Thailand, Malaysia, Macau, Indonesia, Mongolia, Taiwan, and China. NASA, ESA, JAXA, and others indicated they would like to build their own space-based NEO survey telescopes – if they had the budget for it. None do. Stay tuned for PDC 2015, Part 2 – in which I will discuss reports from two teams working on concepts for a space-based NEO survey telescope. * My work is funded in part by the NEO Observations Program. However, no one at NASA asked me to write this blog post.